Great for all monolight brands using a 2-3/4'' (70mm) to 3 7/8 " (98 mm) diameter reflector including Elinchrom, Bowens, Profoto, Novatron, Speedotron , Norman Smith-Victor, Hensel , Alien Bees, Visico, White lightning etc. 100% BRAND NEW!! 1 Year Warranty! The Universal Barn door kit comes with a grid and 4 color gels with metal frames. Barn door devices alter the shape, amount, or color of the light output from the flash heads. The barn door can direct your light beam from narrow to wide, giving you greater control over your spill light. It can also be used for flagging and hard dramatic lighting. The set boasts an all metal construction that will last for years. Using a barn door set will allow you to control the way you cast light on your subject. The positioning of the barn door's leaves will determine the size of the shaft of light. Rotating the leaves will determine its angle. A 4-leaf barn door provides more light control than a 2-leaf barn door set. Four (4) color gels to allow you to have different background colors. Gels are used to either correct the light balance or create dramatic lighting effects. These are also used to change colors of backgrounds. 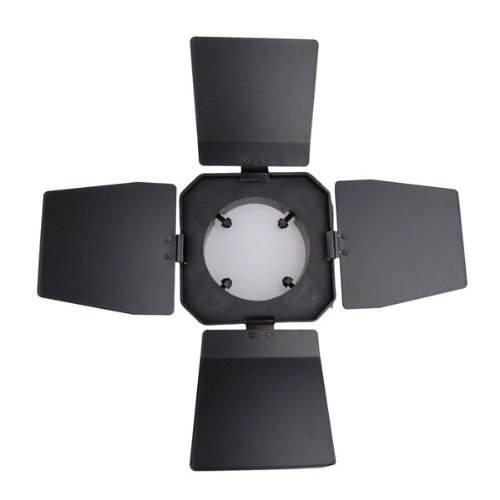 The gels are designed to be used with the barn door attachment/lens holder. One (1) Honeycomb designed to give you ultimate control on the direction of your light. The honeycomb grid will turn a strobe head into a specular light source. It will emit a beam of light precisely where you aim. Photographers who use these tend to use many, "painting a scene" precisely with pools of light. 1 YEAR WARRANTY BY SELLER. Norman QL350 350 watt Tungsten Lamp for the Allure C1000.